Increased awareness of social value, sustainability and modern slavery is driving procurement teams to have to think smarter about how they ethically procure the services and products their business needs. From scandals in the fashion sector to challenges faced by the food industry, the need to be clearer about what's in your supply chain and what you're buying is a positive new role procurement teams can play in driving up standards. 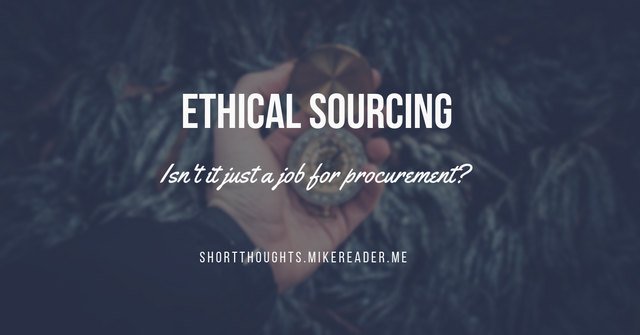 Ethical procurement is a topic that will keep getting bigger and will challenge the construction industry. But in my view it shouldn't end with procurement. Organisations need to develop cradle-to-grave processes for ensuring their supply chain is ethically procured, managed and supported across each contract. I worry the emphasis always falls on procurement, when in fact it's the contract managers and users who often needs to make sure the commitments and processes proposed by bidders are delivered. In a major organisation there will be a category management team who should support suppliers to get the best from processes whilst auditing and policing delivery to make sure commitments are met, but in the stretched public sector where I work this role often falls between procurement and operations. The emphasis on procurement being the leader runs through the industry. As an example, with modern slavery act compliance reporting now mandatory for large businesses, I was pleased last year to support an LGA campaign across local governments that was aimed at improving compliance and monitoring within the public sector. But again the approach proposed focuses too much on procurement being the gate keeper, suggesting that if you get a pass from procurement there's less scrutiny needed. We also need to consider how ethical procurement and sourcing will be impacted by the digital agenda, "the fourth industrial revolution". Research by the Hackett Group suggests that 95% of procurement groups they surveyed in their recent CPO Agenda paper "expect a digital revolution to overhaul their operations within a matter of years." This should increase the ability of clients to trace and assure the materials, labour and suppliers within their supply chain, but unless clients act early and set out clear requirements as to what they want to achieve, and how they want suppliers to help them achieve it, they could end up with a myriad of solutions and strategies, much akin to the problem facing some clients who didn't get their act together on social value. Overall we are making positive strides to ensure our supply chains are more accountable, traceable, ethical and sustainable, but there's a lot further to go to making sure this is embedded beyond procurement and into operations and category management.